In the Byzantine-Arab wars of the Heraclian Dynasty, the Arabs nearly destroyed the Byzantine Empire altogether. In order to fight back, the Byzantines created a new military system, known as the theme system, in which land was granted to farmers who, in return, would provide the empire with loyal soldiers. The efficiency of this system allowed the dynasty to keep hold of Asia Minor. The Arabs were finally repulsed through the use of Greek fire, but Constantinople had decreased massively in size, due to relocation. The empire was now poorer and society was dominated by the military, as a result of the many Arab invasions. A new military system created during the Heraclian Dynasty of the Byzantine Empire, in which land was granted to farmers who, in return, would provide the empire with loyal soldiers. Similar to the feudal system of medieval western Europe. A military weapon invented during the Byzantine Heraclian Dynasty; flaming projectiles that could burn while floating on water, and thus could be used for naval warfare. A city/place or person that embraces multicultural demographics. Islamic state led by a supreme religious and political leader, known as a caliph (i.e., “successor”) to Muhammad and the other prophets of Islam. 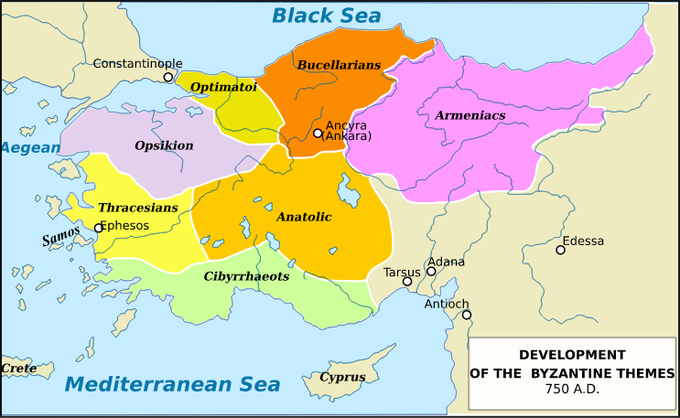 The themes (themata in Greek) were the main administrative divisions of the middle Byzantine Empire. They were established in the mid-7th century in the aftermath of the Slavic invasion of the Balkans, and Muslim conquests of parts of Byzantine territory. The themes replaced the earlier provincial system established by Diocletian and Constantine the Great. In their origin, the first themes were created from the areas of encampment of the field armies of the East Roman army, and their names corresponded to the military units that had existed in those areas. The theme system reached its apogee in the 9th and 10th centuries, as older themes were split up and the conquest of territory resulted in the creation of new ones. The original theme system underwent significant changes in the 11th and 12th centuries, but the term remained in use as a provincial and financial circumscription, until the very end of the empire. During the late 6th and early 7th centuries, the Eastern Roman Empire was under frequent attack from all sides. The successors of Heraclius had to fight a desperate war against the Arabs in order to keep them from conquering the entire Byzantine Empire; these conflicts were known as the Byzantine-Arab wars. The Arab invasions were unlike any other threat the Byzantines ever faced. Fighting a zealous holy war for Islam, the Arabs defeated army after army of the Byzantines, and nearly destroyed the empire. Egypt fell to the Arabs in 642 CE, and Carthage as well in 647 CE, and the Eastern Mediterranean slightly later. From 674-678 CE the Arabs laid siege to Constantinople itself. In order to survive and fight back, the Byzantines created a new military system, known as the theme system. Abandoning the professional army inherited from the Roman past, the Byzantines granted land to farmers who, in return, would provide the empire with loyal soldiers. This was similar to the feudal system in medieval western Europe, but it differed in one important way—in the Byzantine theme system, the state continued to own the land, and simply leased it in exchange for service, whereas in the feudal system ownership of the lands was given over entirely to vassals. This efficiency of the theme system allowed the dynasty to keep hold of the imperial heartland of Asia Minor. Thus, by the turning of the 8th century, the themes had become the dominant feature of imperial administration. Their large size and power, however, made their generals prone to revolt, as had been evidenced in the turbulent period 695-715, and would again during the great revolt of Artabasdos in 741-742. The Theme System. Map depicting the locations of the themes established during the Heraclian Dynasty of the Byzantine Empire. Despite the prominence of the themes, it was some time before they became the basic unit of the imperial administrative system. Although they had become associated with specific regions by the early 8th century, it took until the end of the 8th century for the civil fiscal administration to begin being organized around them, instead of following the old provincial system. This process, resulting in unified control over both military and civil affairs of each theme by its strategos, was complete by the mid-9th century, and is the “classical” thematic model. The term theme was ambiguous, referring both to a form of military tenure and to an administrative division. A theme was an arrangement of plots of land given for farming to the soldiers. The soldiers were still technically a military unit, under the command of a strategos, and they did not own the land they worked, as it was still controlled by the state. Therefore, for its use the soldiers’ pay was reduced. By accepting this proposition, the participants agreed that their descendants would also serve in the military and work in a theme, thus simultaneously reducing the need for unpopular conscription, as well as cheaply maintaining the military. It also allowed for the settling of conquered lands, as there was always a substantial addition made to public lands during a conquest. The commander of a theme, however, did not only command his soldiers. He united the civil and military jurisdictions in the territorial area in question. Thus the division set up by Diocletian between civil governors (praesides) and military commanders (duces) was abolished, and the empire returned to a system much more similar to that of the Republic or the Principate, where provincial governors had also commanded the armies in their area. Early on, Heraclius had proven himself to be an excellent Emperor—his reorganization of the empire into themes allowed the Byzantines to extract as much as they possibly could to increase their military potential. This became essential after 650, when the Islamic Caliphate was far more resourceful and powerful then the Byzantines were. As a result, a high level of efficiency was needed to combat the Arabs, achieved in part due to the theme system. The Arabs were finally repulsed through the use of Greek fire, flaming projectiles that could burn while floating on water, and thus, could be used for naval warfare. Greek fire was a closely guarded state secret, a secret that has since been lost. The composition of Greek fire remains a matter of speculation and debate, with proposals including combinations of pine resin, naphtha, quicklime, sulfur, or niter. Byzantine use of incendiary mixtures was especially effective, thanks to the use of pressurized nozzles or siphōn to project the liquid onto the enemy. The Arab-Muslim navies eventually adapted to their use. Under constant threat of attack, Constantinople had dropped substantially in size, due to relocation, from 500,000 to 40,000-70,000. By the end of the Heraclian Dynasty in 711 CE, the empire had transformed from the Eastern Roman Empire, with its urbanized, cosmopolitan civilization, to the medieval Byzantine Empire, an agrarian, military-dominated society in a lengthy struggle with the Muslims. The loss of the empire’s richest provinces, coupled with successive invasions, had reduced the imperial economy to a relatively impoverished state, compared to the resources available to the Caliphate. The monetary economy persisted, but the barter economy experienced a revival as well. However, this state was also far more homogeneous than the Eastern Roman Empire; the borders had shrunk, such that many of the Latin-speaking territories were lost and the dynasty was reduced to its mostly Greek-speaking territories. This enabled it to weather these storms and enter a period of stability under the next dynasty, the Isaurian Dynasty.